Please join us every Sunday at 10 and 11 a.m.
Live webcast Sundays at 10 & 11 a.m.
A true Christian is one who trusts in and follows the Lord Jesus Christ and His teachings, yet so many people in our day who claim to be “Christians” are sadly ignorant of the teachings and doctrine of Jesus Christ as revealed in the Bible. Add to this the fact that there is so much error, confusion, and division amongst professing Christians over what the Bible really teaches. This proves the necessity of engaging ourselves in serious and diligent self-examination as commanded in God’s Word – “Examine yourselves, whether ye be in the faith; prove your own selves. Know ye not your own selves, how that Jesus Christ is in you, except ye be reprobates?” (2 Corinthians 13:5). 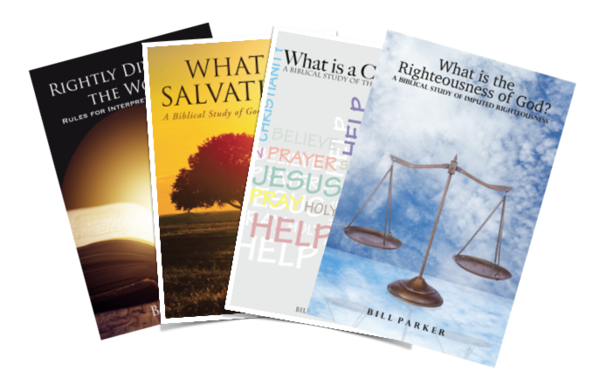 Pastor Bill Parker has written the following books to aid professing Christians in a serious, sincere, and prayerful study of the Bible for this very purpose.